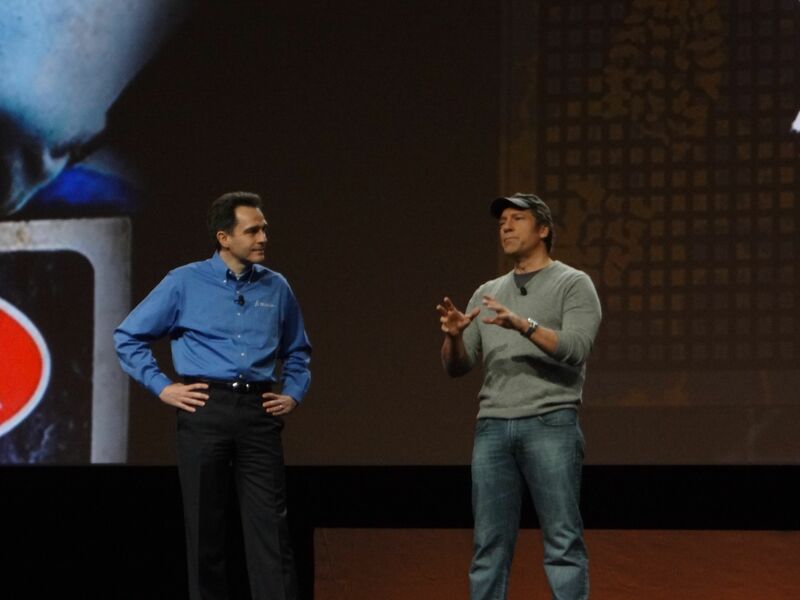 SolidWorks World “officially” began this morning with the first General Session of the week. The conference kicked off with some nice CG Animations of a robot band featuring a bot named “NAO” (pronounced “Now”). (The Robot was designed in SolidWorks.) 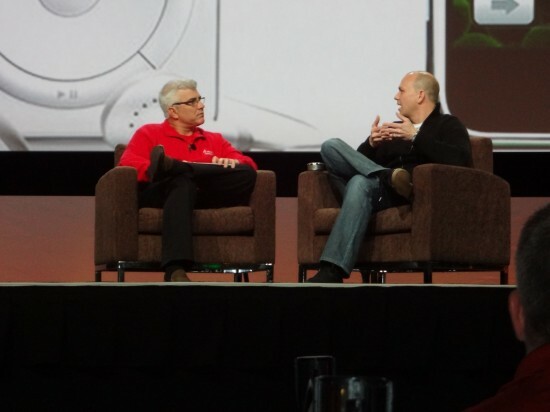 The video ended with a NAO robot on stage introducing SolidWorks CEO Bertrand Sicot. Not one, but TWO big names made appearances this morning. Everyone knew ahead of time that Tony Fadell (the father of the iPod) was going to appear, but we also got a surprise appearance by Mike Rowe from Dirty Jobs! Mike discussed the origins of Dirty Jobs and also talked about his website, MikeRoweWorks, which is a site that helps people with special trade skills find jobs. 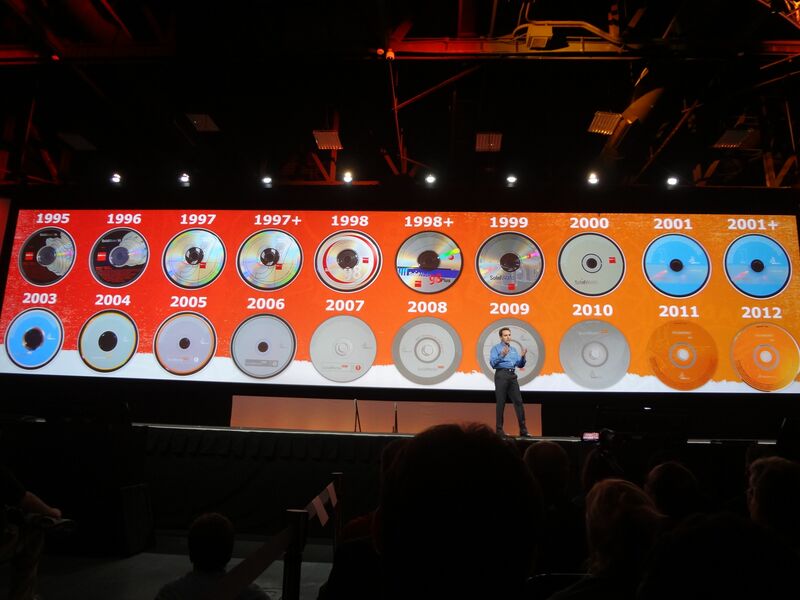 I thought this picture below looked pretty neat….it is ALL the SolidWorks Discs for every release. During the Tony Fadell interview, you could definitely see some “Steve Jobs Influence” in how he and his team designs products. 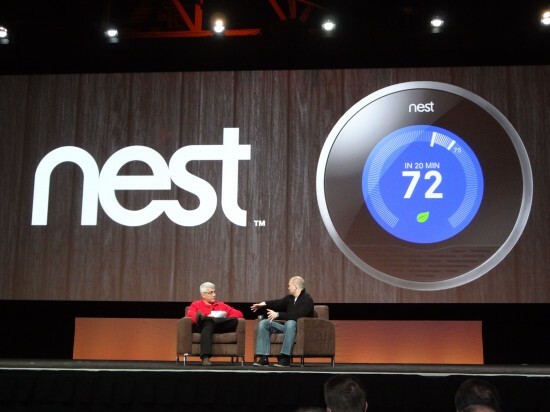 He talked about the origins of the iPod and showed his latest product, Nest, which is a digital thermostat designed to conserve energy along with providing wireless access control from anywhere via iOS apps. 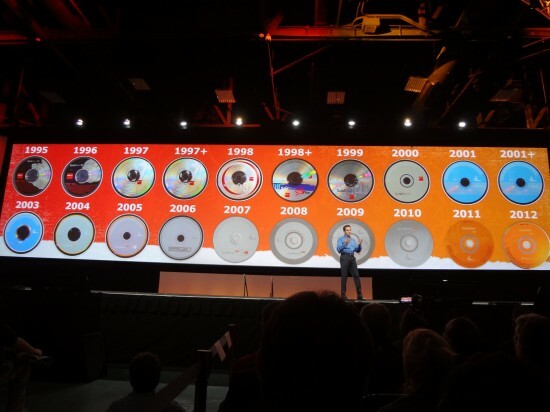 It is our job to look 5, 10, 15 years down the road at the next generation platform to keep you competitive. We cannot build the next generation platform without the latest technology. We will debut the new platform next year. We will continue to develop the current platform until you tell us that you don’t need that anymore with no change in data format. When our next generation will be ready you will tell us. We will let you choose which application you want to use. No one will be forced to move to the new platform. When you choose to switch, we will make sure that the transition is seamless. I’ve put all my images on Flickr, so you can check them out HERE. I just happened to look at the SolidWorks website tonight and noticed that the color scheme has been changed to look like the DS corporate site. 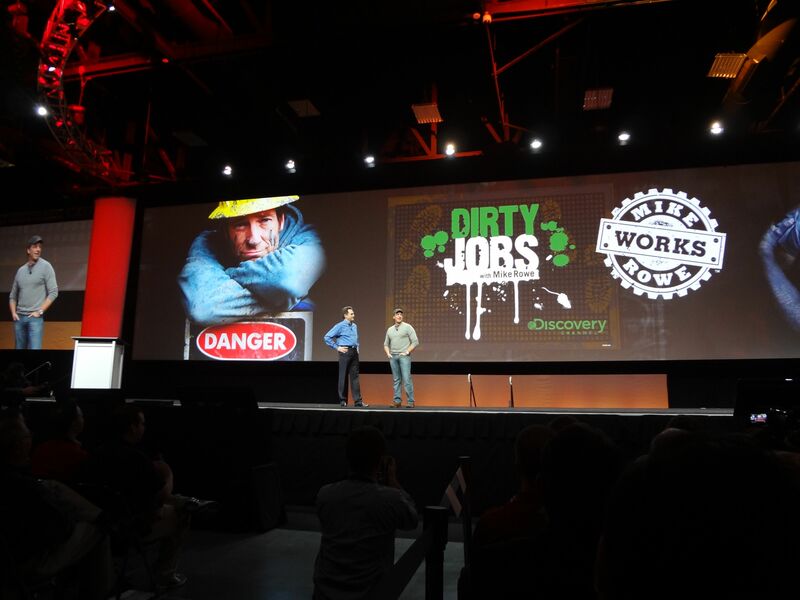 SolidWorks has posted several videos from the General Session today on their YouTube Channel. That is all for now….I’ll have follow up thoughts later on. Stay tuned…more to come! Keyboard Shortcuts – TRY IT! Thanks Ricky, you are letting all of us that cannot be there, know what is going on. It is also not skimpy information either. Great coverage here. Thanks my friend. If you participate in this pcerojt again, you might want to make the plate of drinks tilt in the direction the robot accelerates (into curves, forward if speeding up, backward if slowing down). If you get the cups to tilt just enough, the force of your robot’s motion will be combined with gravity to push the drinks towards the now-tilted cup base. Physics are a prerequisite.